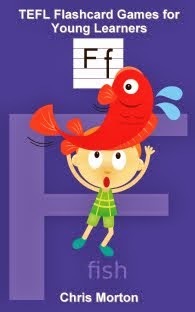 Now that TEFL Flashcard Games for Young Learners is to be published, I have found that, for copyright reasons, I am no longer able to post those FC games (included in the book) on my blog. So there is only one thing for it – write a whole new set of games and post those! The challenge is: can I come up with enough new games to continue posting on a regular basis? We will see. The activities in my TEFL Flashcard Games book are ordered to be progressively more challenging. Primary drills are used for the first time the students come into contact with the vocabulary (look, listen and repeat); then things became more student-centred: following games test how well students can remember the FCs (matching games); work on individual pronunciation, and finally there are games for using the new vocabulary in a language context. In this blog I have decided to be less strict with the ordering of the games. I am, after all, simply posting up a new game when I think of one. I hope that these posts can be of help to all TEFL teachers - and for more games you can of course click on the 'Buy the Book' page for the Amazon link (and a free look inside).